JEN’s business partner, Fumidas, has been working on solving social issues in regions since before the earthquake. Right after the earthquake, Fumidas visited regions distributing relief goods and made various activities to support local communities. Kumamoto, before the earthquake, faced a big problem of lack of people leading the society due to declining birthrate and aging population, as other prefectures do. JEN agreed with the vision of Fumidas to “build a society where young local people can participate actively for the future of Kumamoto” and opened “ASUKUMA”. 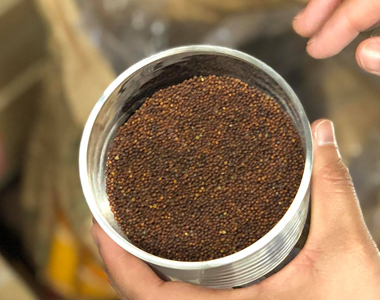 The 20 members of the inaugural class who joined ASUKUMA mostly through word-of-mouth finished its training program in March 2017, and each of them started to work on making a small business back in each home town. Ms. Sato is one of the participants of ASUKUMA. 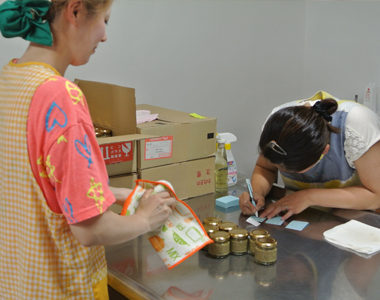 When we first met, Ms. Sato was challenging on commercialization of Aso-Takanard, a mustard using pickled mustard leaf in Aso. He was in a dilemma of not being able to reach the point of making his living although he makes and sells Aso-Takanard. 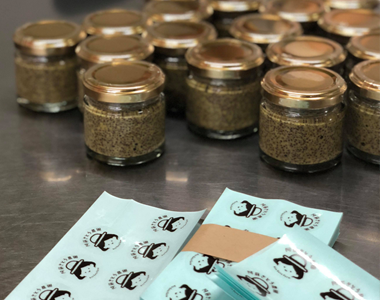 Through participation into ASUKUMA, Ms. Sato made its vision clear to put the business on track and built a timeline to systematically launch new products into the world. Last year, Aso Takanard got a good evaluation and was awarded the Minister of Agriculture, Forestry and Fisheries Award in the Best Local Food Central Competition. The momentum goes on and she seems to have increasing number of opportunities to be invited to lectures and meetings for information sharing from all over Japan. She is spending very busy daily lives, meeting with local cooperators of her business as well as professionals and young people with similar ambitions, and expanding the sales network based on her personal human network. She hires a few part-time workers but basically does production only by herself. How does the production site look like? The production site is a wonderful place where they can have sharp eyes for every detail, condensing the personality of Ms. Sato who is cool and stoic under her great smiling face. By the way, all the visiting members this time are female. “These type of working women is hard to find partners….” This is the common feeling of the members. We felt from the bottom of our heart that we want to support Ms. Sato who is building her business with her determined vision at full fling while having some worries as a female. The second generation of ASUKUMA is getting its shape. This time we will support a home business succession project for young farmers, aiming to increase the number of young people choosing to succeed agriculture as one of the appealing career by continuously communicating the appealing point of agriculture. We will also support a part of revitalization project of Minami-Oguni-cho which is suffering a reputational damage from the earthquake. We appreciate your support on ASUKUMA2 project going forward. 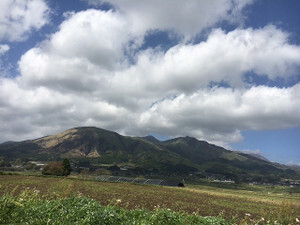 Fresh verdure of ASO is very beautiful with wide sky. A person in charge of media does not have a chance to visit field, I had an opportunity to visit city of ASO with overseas supporter this time. I feel to become an ant in large palm. About 40 thousand years ago, Land was carved in by eruption and made caldera. The caldera became plateau with height 800m after long period. We acknowledge that there are people life in ASO with nature long time ago. Ms Tomoka Sato who makes Aso-Takanard is one of them. Ms. Sato participated ASUKUMA form the beginning. She was born and raised in Aso and move to Osaka for her job. Ms. Sato is also person to leave home town such as young people living in country side. However, she wants to live in ASO.She wanted to reduce the abandoned land of Aso.In addition, she thought that she did not want to lose her favorite Aso-Takana who grows only in Aso. 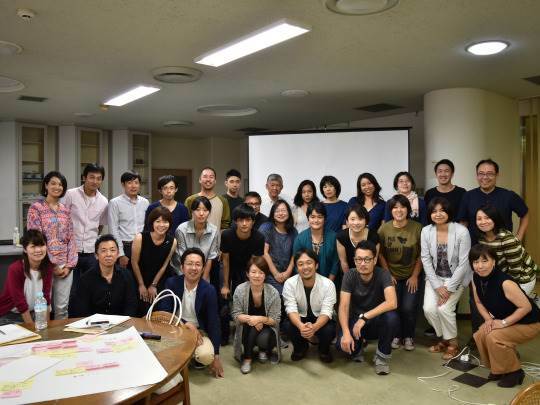 ※ASUKUMA …Workshop program to generate projects to revitalize Kumamoto based on person, things and culture in Kumamoto. She decided to return to her grandmother in Kumamoto from Osaka. 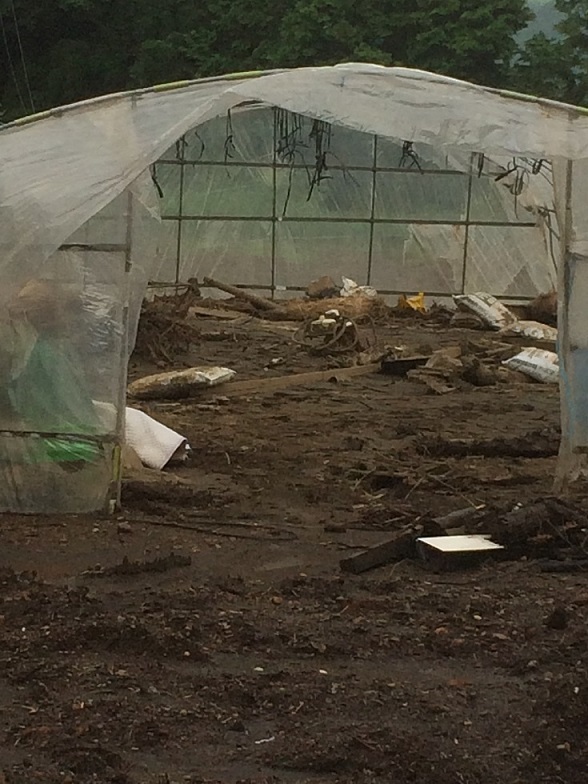 Then, she has been fully engaged in ASO vegetables and had many challenges. Her love for ASO vegetable has been increasing and she had strong will to introduce ASO vegetable in future. Continue to part2. Over a year and a half have passed since the Kumamoto earthquakes. Walking in the city center of Kumamoto, you may no longer find any scars of the earthquakes, but in the suburbs, local industries are still suffering from large impacts of the disaster. Aso City had been attracting many tourists before the earthquakes, mainly students visiting on school trips, however, after the quakes bulk cancellation of trips followed one after another. The earthquakes cut off rail and highway connections between Kumamoto and Aso Cities. 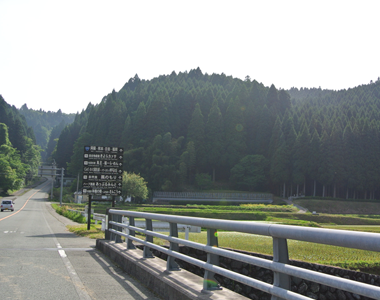 Tourists visiting Aso via the only remaining mountain road are limited, and both tourism and agriculture with rice paddies, which had been providing local food and tourist attractions, remain unrecoverable. 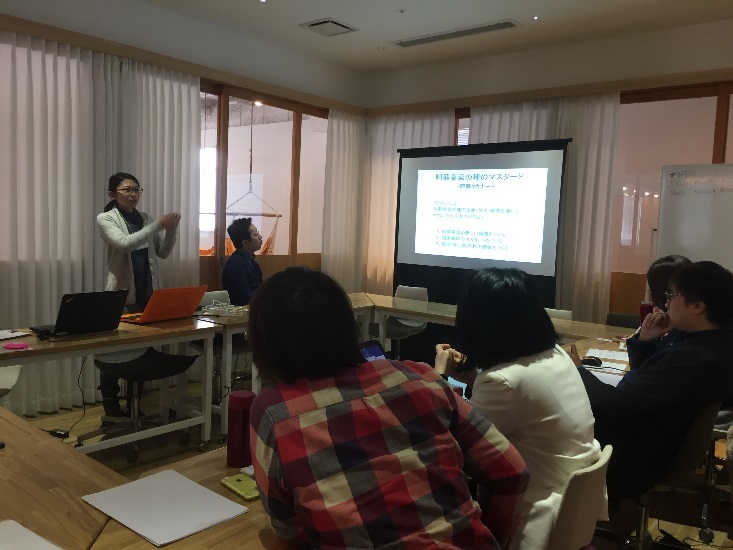 After the earthquakes, JEN formed a partnership with Fumidas, a general incorporated association that has been fostering young persons for many years in Kumamoto, and through the joint project “ASUKUMA” we have assisted the entrepreneurship of young people who are contributing to the revitalization of the community. The participants have started up various initiatives, such as managing a community café and selling agricultural processed foods. The ASUKUMA project came to an end over a half year ago in March 2017. 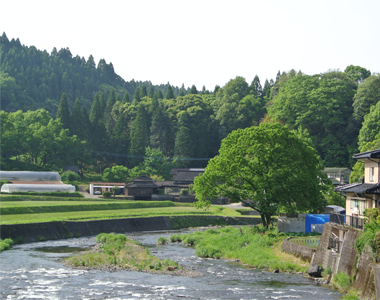 Now, “ASUKUMA II” is planned to start in order to support people who are struggling in the tourist spots where the impacts of the earthquakes are still evident. 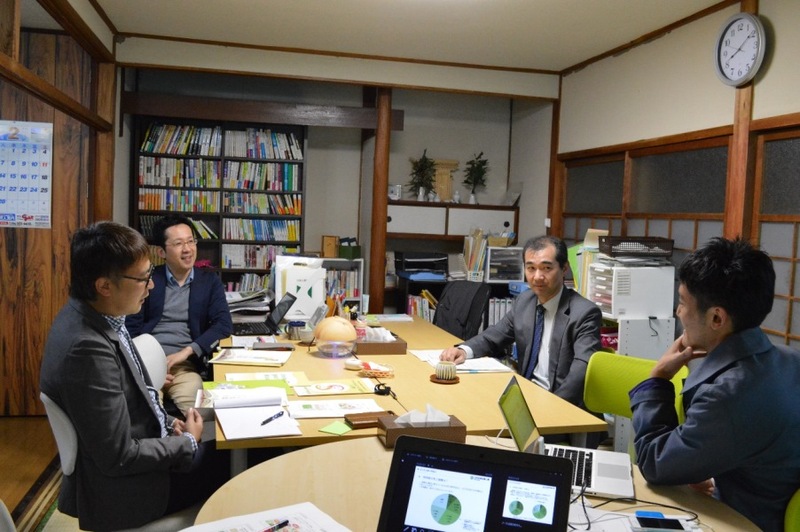 Unlike the previous ASUKUMA project that targeted individual participants from various parts of Kumamoto prefecture, ASUKUMA II will focus on Aso City and Minami Oguni Town and provide local people with help on problem-solving as groups. We would appreciate your continuous support for ASUKUMA II to create the future of Kumamoto through such initiatives as planning and pilot projects. 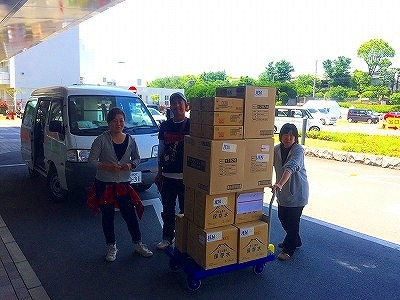 This year JEN, with our partner organization, Muse Planning (contents available only in Japanese), gave help to single parents who were affected by the Kumamoto earthquake as part of our assistance activities for victims of the earthquake. 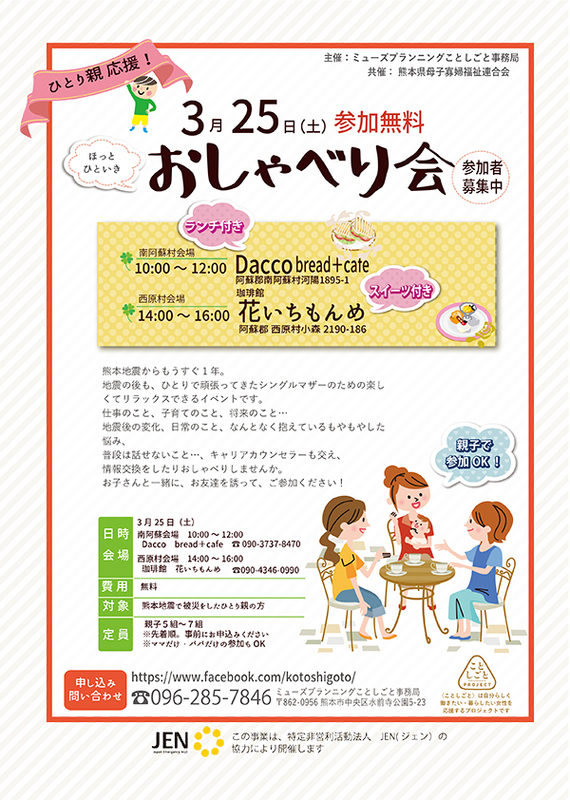 The “Single-Parent Chat and Lunch Meetings” were held in Mashiki Town and Higashi-ku, Kumamoto City in March and April, respectively. In these meetings, single parents took the time to talk to each other about their daily lives. A career counselor ran a workshop to give advice on how to get a job. Average annual income of single mothers in Kumamoto City has not increased for quite some time and has been stuck at about 1.8 million yen, which is less than half the average wage of the entire Kumamoto Prefecture. Single fathers earn 2.91 million yen, which is about 70% of the prefecture’s average (according to the Kumamoto prefecture single parent family survey). The earthquake affected areas where already earning a living was not easy. 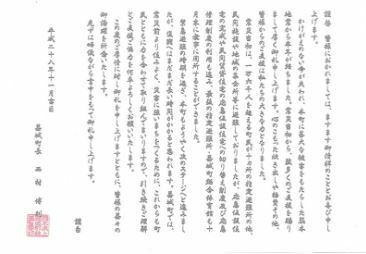 Kumamoto Prefecture conducted a survey on single parent families in August, four months after the disaster (findings on the conditions of single parent families after Kumamoto earthquake can be found here - contents available only in Japanese). One year and a month have passed since the Kumamoto Earthquake, which caused significant damage to the area. According to the announcement by the prefectural government of Kumamoto, 225 people lost their precious lives and nearly 200,000 houses have been damaged. Locals, the administration and support groups are still working hard for the recovery. JEN arrived in Kumamoto on April 15, the next day of the foreshock. At the beginning, we did support activities mainly for the people in the evacuation sites as the lifeline had not been restored. With the stores and shops still closed, our activities included distributing bento boxes and underwear as well as providing bath service for those having difficulty in taking a bath. 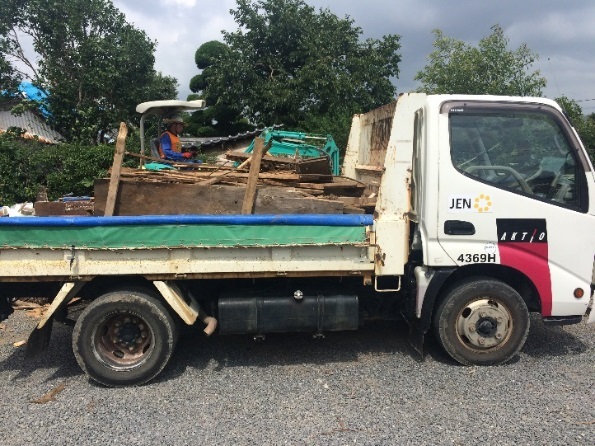 JEN also provided local communities and support organizations with trucks and materials in order to help accelerate the removal of debris as the evacuation sites became integrated and closed. 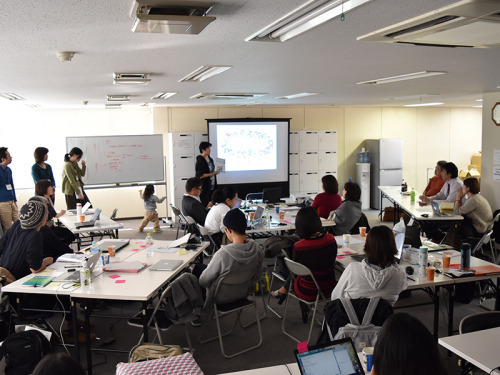 When the emergency period was coming to an end, JEN thought about how to give support that can lead to fundamental solutions to local issues in Kumamoto. We met a lot of people. As a result, JEN started a workshop project named “The School for a Bright Tomorrow in Kumamoto (ASUKUMA)”, in cooperation with the support group that had been doing similar activities even before the earthquake. The first period of this workshop ended in March 2017. Many of the participants are still trying hard to solve local problems in various fields. 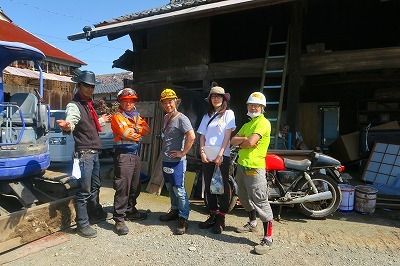 JEN continues to work together with people in Kumamoto. A lot of people have been taking part in ASUKUMA, the workshop for raising leaders who try to address social issues in the local communities, since September last year. Follow-up trainings have been carried out since the initial plan came to an end, and new members also have joined. There are many people who are trying or have already tried to address the local issues in Kumamoto. JEN continues to hold workshops to explore the theme of “Whose and what kind of problems are we going to solve?” while helping to introduce relevant people. Eight months have passed since the Kumamoto earthquake. 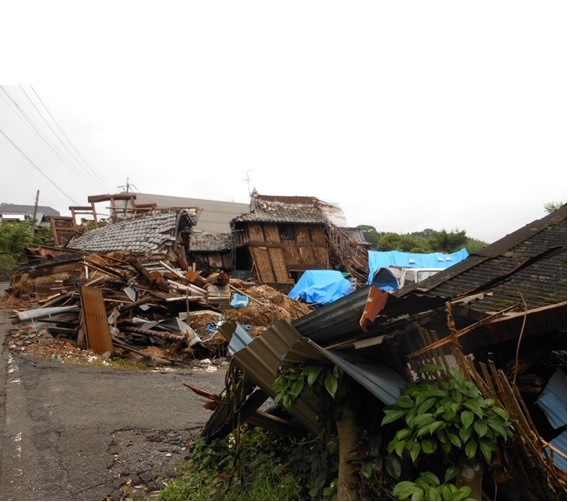 More than 2,000 houses were certified as fully or partially destroyed and 116 households of survivors are living in temporary housing in Aso City. Christmas presents were given to five temporary housings on November 23rd. Dressed as Santa Claus and reindeer, volunteers from both inside and outside of Kumamoto Prefecture delivered aid from across the country. JEN helped with preparing the presents, sorting aid and delivering the presents. It is our pleasure to report to everyone who has helped us that we have received this honorable letter from the mayor of Mashiki expressing his appreciation for our support following the Kumamoto earthquake that struck the town on April 16, 2016. 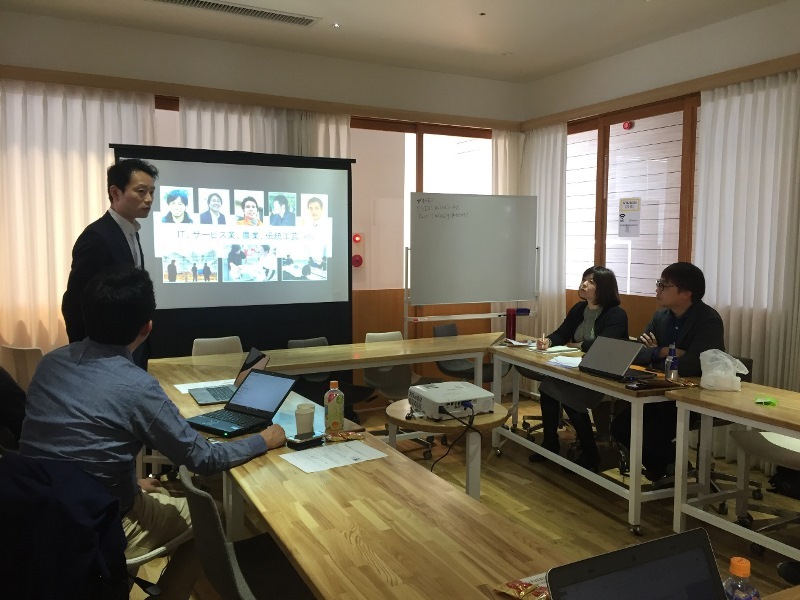 The members of the Asukuma Project have been working to address challenges to businesses in disaster situations for two months since the Project’s inception. 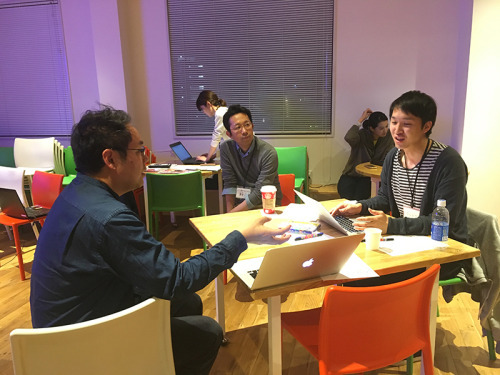 The final workshop took place from December 2nd through 3rd. A total of 20 participants came up with 11 issues to be addressed. Some issues were brought to light by the earthquake and other issues were revealed during the Project activities. Importantly, the participants considered what kind of business would be able to survive natural disasters. This presentation was a compilation of participant’s efforts over the past two months to consider the challenges involved with building sustainable businesses. These efforts evolved into their business plans. To help them flesh out their business plans, JEN has kept a close eye on their development. 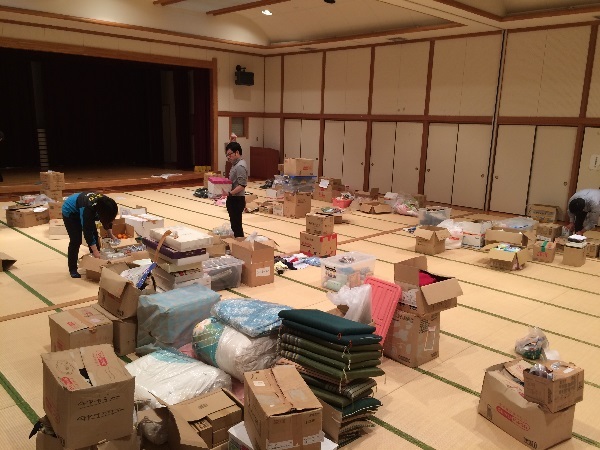 Following the devastating Kumamoto earthquake in April, 2016, support organizations, including JEN, came to Kumamoto and have been providing support to survivors. While it is true that organizations from other prefectures are working hard, local organizations have an advantage over outside ones in approaching affected people, understanding their needs, and providing precise assistance to them. JEN regards assisting those local organizations as a pillar of its supportive activities in Kumamoto. Kumamoto Green Co-op is one of the local organizations that have been supporting survivors since shortly after the occurrence of the earthquake. As one of the ways to assist the cooperative, JEN has been lending it a freight truck since September. 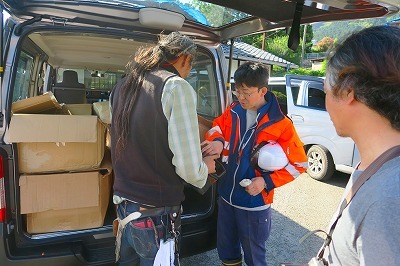 The Kumamoto Green Co-op has approached the aftermath of the earthquake on a number of fronts since 15, April, the day after the occurrence of the Kumamoto earthquake, including by: delivering relief supplies including food and water; helping with debris removal and cleaning up survivors’ houses; offering baths, legal aid services, entertainment for children, and a food van service; and preparing meals outdoors. In each activity, it has been displaying the advantages of its connections in the area and a delivery capability to reach every survivor there. Approximately 4,000 units of temporary housing for people displaced by the earthquake have been built around the prefecture. Local governments and social welfare councils are helping survivors move into the temporary housing. Other displaced people include about 9,000 households of survivors who are living in rental housing subsidized by the government to make up for the lack of temporary housing, and yet more survivors are still living in their damaged houses. Unlike those survivors living in the temporary housing, the survivors living in rental housing, or in their own damaged houses, are in a vulnerable position because it is extremely difficult for local governments to track their whereabouts and understand the problems that these people face. 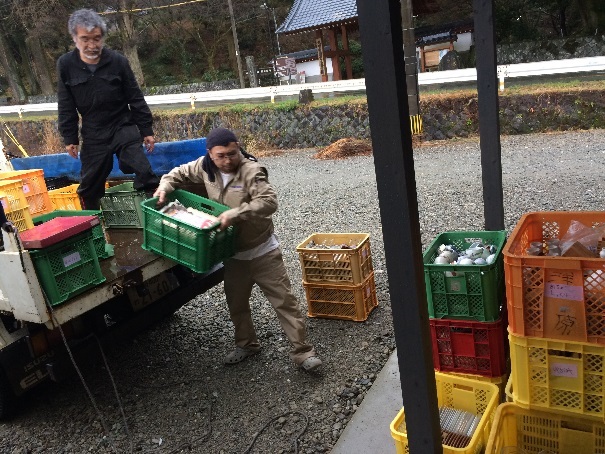 Responding to this situation, the Kumamoto Green Co-op has taken advantage of its own network of connections to approach those survivors, understand their needs, and provide meticulous assistance to them. 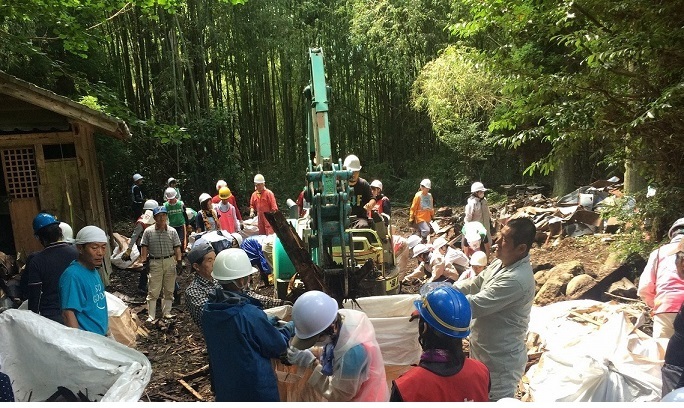 One example is a support activity being done in Minamiaso village. In some parts of the village water supply is still disrupted but survivors who have cows and fields to look after can’t leave their houses. 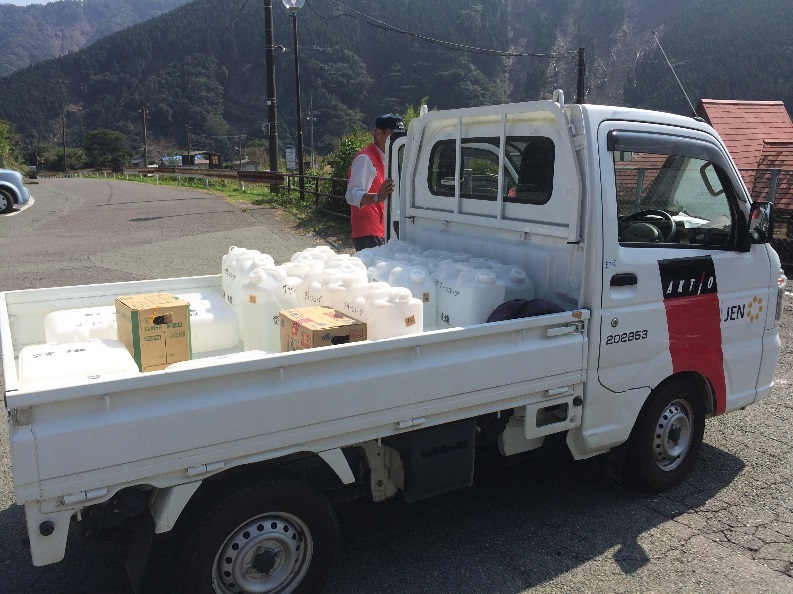 The Kumamoto Green Co-op has been supplying water necessary for daily life and a tank of water for agricultural purposes to those survivors. 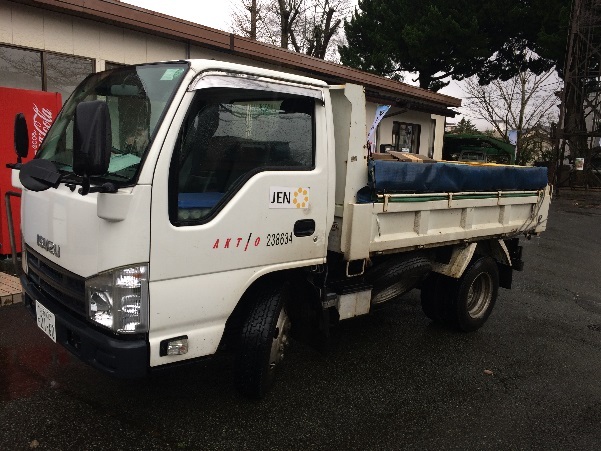 JEN is lending a delivery truck to the Kumamoto Green Co-op so that it can deliver aid more quickly to further parts of the area. 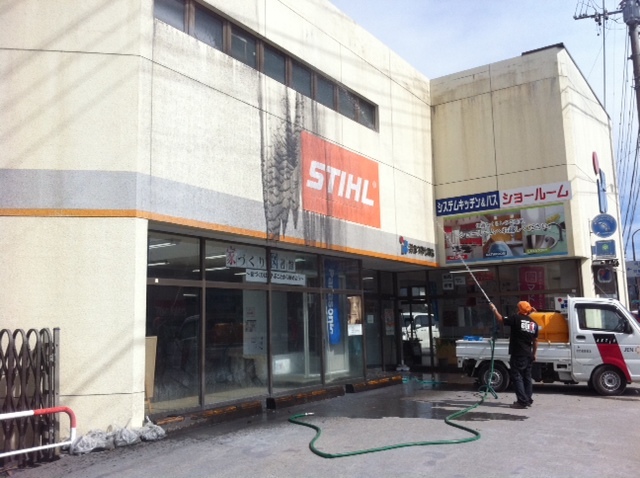 JEN’s support activities also include efforts to wash off volcanic ash with high-pressure sprayers in Miyaji district, Aso city, which was covered with volcanic ash from the nearby volcano which erupted last November. JEN will continue helping the earthquake survivors to restore their lives. Six months have passed since the earthquake in April, 2016. JEN has been engaged in supportive activities since the aftermath. Nevertheless, the road to recovery is a long one, and we still have many victims needing support. As of this October, 120 deaths including earthquake-related ones were recorded. The recorded damage to houses were: 8,849 completely destroyed; 30,809 half destroyed; 132,339 partially destroyed. Other than that, if damage to other property is included, overall toll will become really huge. As many as 8 municipalities are still providing 12 shelters, where 301 people are living the life of a refugee. 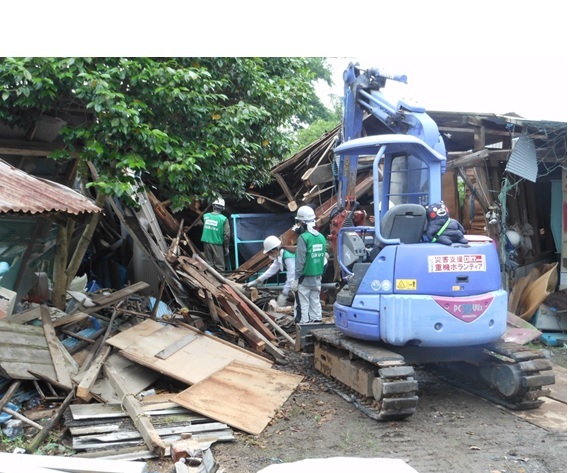 Consequently, construction of temporary housing for victims is now underway. Even though 4,052 housing units have been built in 8 municipalities, they are not enough to supply the demand. Also, we must note that quite a number of victims are still living in their damaged houses or tents pitched in front of their houses. Both private organizations and the government have implemented a variety of supportive activities for Kumamoto. When it comes to house-related support, the government subsidizes the cost of the demolition of completely or half destroyed houses, whereas private organizations help demolish the buildings that are ineligible for subsidies. In each temporary housing complex, victims are making a collective effort to organize their own community, establishing a residents’ association or holding assemblies at a meeting place attached to the complex. Although each person who took part in supportive activities did their best to come up with ways to support victims, you can still see not only earthquake devastation remaining everywhere but also many victims in a difficult situation. Six months having passed, the Kumamoto earthquake is nearly fading from people’s memory, but many victims are nonetheless making efforts to get their lives back together while busy cleaning away the rubble of their houses. The Kumamoto earthquake is by no means a thing of the past. Therefore, what we should do now is to express our renewed mourning for all people who died, and not to forget the victims who need our help. JEN will continue helping the victims in Kumamoto move forward on their own. It has been six months since the earthquake hit in Kumamoto. JEN has recently started a new project for the people in the prefecture. The name of the project is called ASUKUMA. ASU means tomorrow and KUMA is the nickname of Kumamoto. Thus, the project’s name implies that Kumamoto can look for a bright tomorrow. ASUKUMA aims to restore the pride of Kumamoto in terms of its people, things, culture, as well as those based on people’s entrepreneurship. It is a two-month workshop. The kick-off day was Sunday, 2nd of October. A total of 20 participants came to “HARMONY”, a center that aims to encourage gender equality and holds events related to it. The project just has started! Many areas in Kumamoto Prefecture were severely affected by the earthquake in April, 2016. Among them, Mashiki town is one of the worst hit areas, suffering much from the human and property damage caused by the disaster. 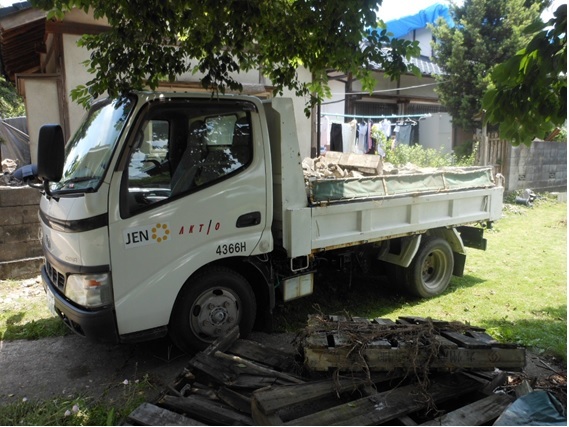 JEN has been helping the local communities in Mashiki’s Shimada Ward remove debris since June. 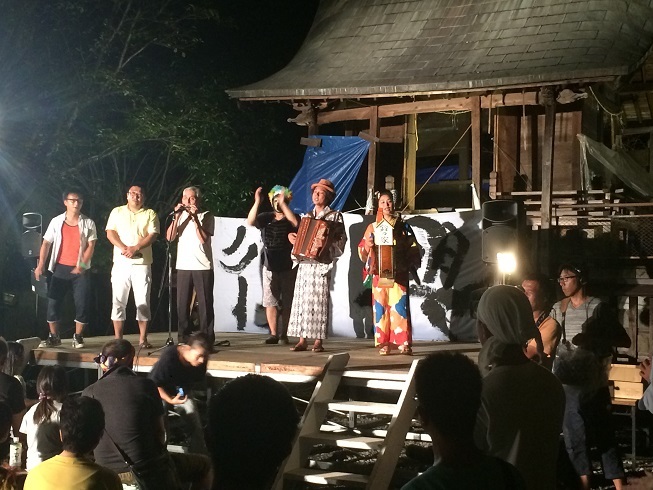 The first festival after the quake was held at Higashimuta village, Shimada Ward, in the town of Mashiki. We are delighted to report how this festival went. While the village has a tradition of holding its summer shrine festival, the villagers had planned to cancel it this year as the shrine has suffered tremendous damage from the quake. Young people in the village, however, gave the cancellation plan some serious thoughts (what the tradition means to them and the festival is for) and came to the conclusion that they should hold the festival as usual despite the tough situation the village was experiencing. Thus, with support from the outside, they managed to maintain their tradition. 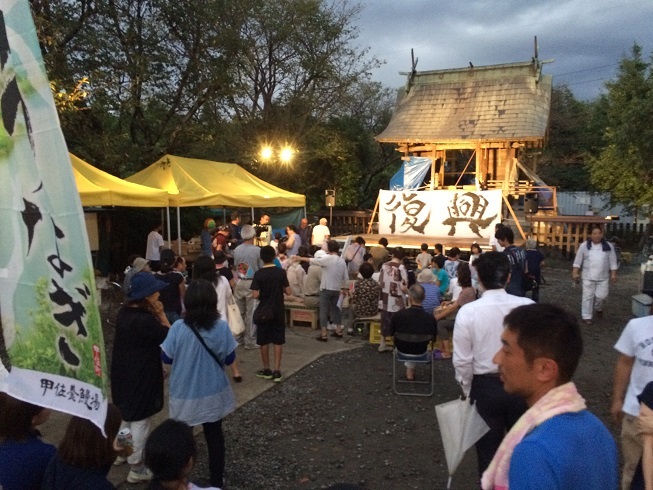 Almost all locals living in Higashimuta village participated in the festival. A booth where professional chefs provided dishes was established, a lively music show was provided by a traditional band, and a comical act was performed by comedians. Overall, the festival was a huge success. One of the organizers said, “Nothing is more enjoyable for men and women of all ages than the festival in our community. I’m happy many people came and joined the festival.” He looked pleased with the result. Moreover, some of the people were able to have a chance to meet their former neighbors. The festival has therefore, more than ever, strengthened community ties. 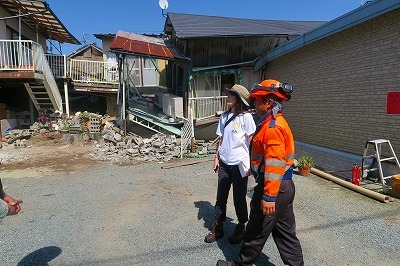 In the city of Aso in Kumamoto Prefecture, where roughly 2,000 homes were affected by the earthquake, reconstruction efforts continue centered mainly on locals working with various humanitarian organizations. Houses and family business attached to homes deemed to have been more than partially destroyed are now being demolished funded by public money. However, efforts to demolish the many buildings that do not fit into the above criteria, such as abandoned houses with high risk of collapse, regular businesses, and sheds, are at a standstill. Lesser known are the landslides that are also affecting the area due to loosened soil after the earthquake. Despite Aso locals and humanitarian groups working together to address these issues, many tasks are left undone due to a lack in manpower. JEN began lending rubble removal vehicles and equipment to local disaster relief groups in the area in mid-July. 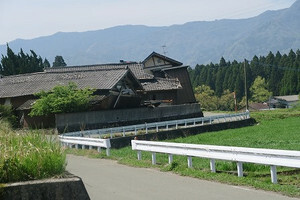 Landslides are pushing sediment down into the crops and houses of Aso locals. Several days ago, a local Shinto shrine was demolished at the request of a local priest. 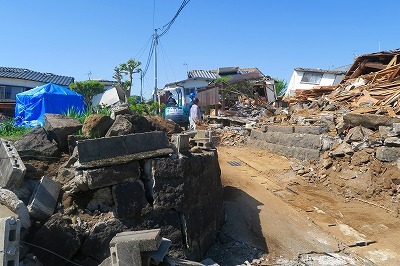 On the day of, the priest and locals worked together to delegate tasks, BIG UP Ishinomaki, a local organization centered on reconstruction efforts following natural disasters, worked as the safety manager and lead procedures, while volunteers came together to complete the demolition. 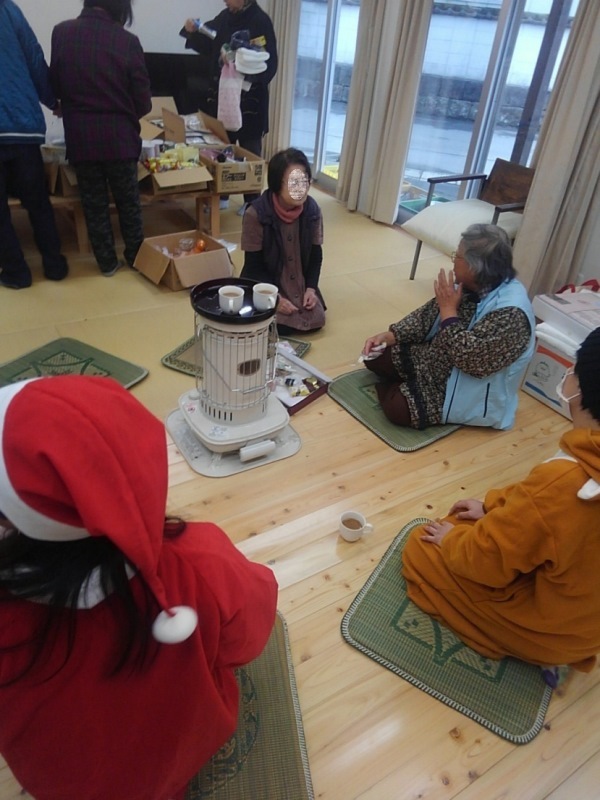 While it will take a while for the shrine to be rebuilt, JEN will continue to support the reconstruction efforts of the committed locals of Aso City. When you drive a car from Kumamoto city to Mashiki city, the road side view in Mashiki shows serious damages of the earthquake. The city was one of the most severely hit disaster areas. The population of the city is approximately 30,000, of which one in ten people, approx. 3.000, still stay at emergency shelters. The recovery work has been insufficient in every corner of Masaki city due to the severe damages. As a result, some victims assist in the recovery process by co-operating with the oraganisations. In order to support the victims; JEN provides safety shoes, as it protects people from injuries by heavy equipment. JEN has also started to rent vehicles, as we encourage removing debris. JEN carries on effectively support the people in Mashiki city. Many of the earthquake survivors lost all their belongings, even though it is little things for example bathing goods. 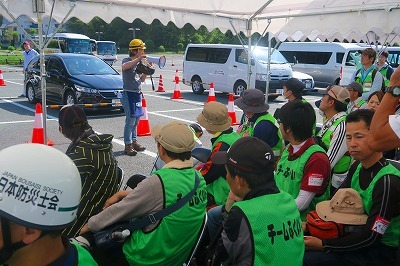 Hygiene-related support for them will become essential since the rainy season is approaching in Kumamoto where well-known for humid and hot weather is. 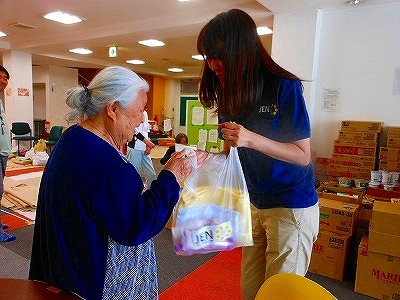 JEN delivered sixty sets of bathing kits consist of shampoo, soap and so on provided by ALBION Co. Ltd., who specialises cosmetics and skin care products, to a community center in the Nishi Ward of Kumamoto City. As of May, about sixty people were living in the community center. 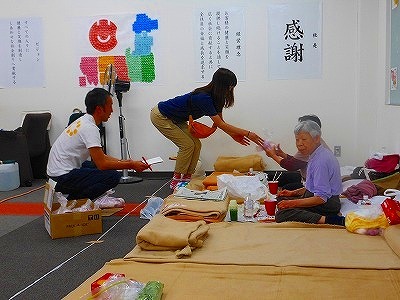 Unlike young people who could move around by their own, elderly people had little opportunities of taking a bath since the earthquake due to the health problems. The kits were useful for them as a shower facility was set up in the community center at the end of the month. In the centre, one of staff who supports the survivors said delightfully “the bathing goods are very useful”. JEN will continue supporting the survivors’ live safely and healthily. 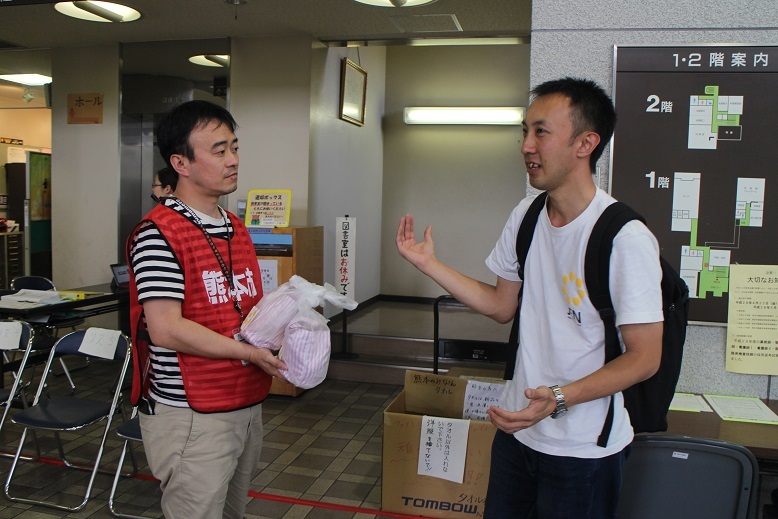 Early this May, nearly 300 evacuation shelters have been consolidated into 22 base shelters in the city of Kumamoto. However, quite a few people have not yet left their original shelters, since they were unwilling to share new shelters with strangers or to live far from home. As a result, many of the shelters that were supposed to be canceled remain unclosed. One of the shelters is located in the building that used to be the office building of Egao, a health food company. JEN has been offering an on-site bath service to this shelter. Besides, recently we also provided aid supplies to help evacuees alleviate the inconvenience of their evacuation lives. One of the major difficulties is the lack of hot water. 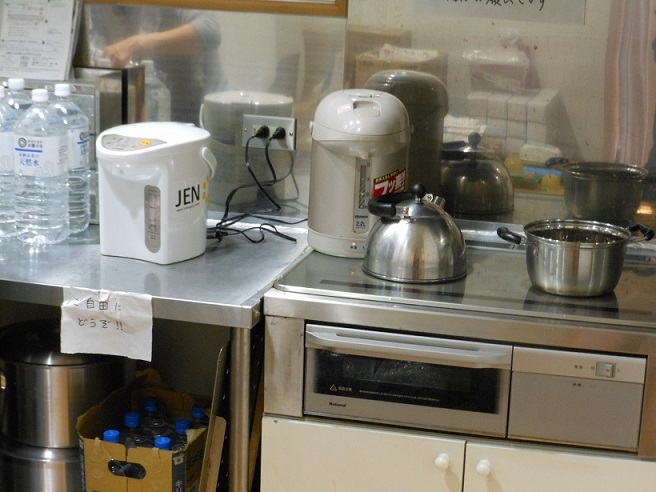 Among the total of fifty evacuees living in the shelter, there is only one electric hot-water pot. It is not sufficient for them, for example, to prepare cup noodles. Thus, you can see queues of people waiting in front of the pot, or the pot becoming empty quickly. In order to improve this situation, we provided two extra hot-water pots. What’s more, the changing weather also causes problems. As the hot season is coming soon, winter blankets provided for cold nights when they just got evacuated will become unsuitable. So we offered a towel blanket for each evacuee. We hope they can extricate themselves from unsettled lives in shelters as soon as possible, but we are afraid that they will have to continue living under these kinds of inconvenience for a while. As a social entrepreneur, Egao dedicated to improving the evacuees’ living conditions, and thus we are committed to assisting its efforts. To Debris Clearing Volunteers: Here are Your Protective Shoes! The earthquake has caused different levels of the devastation of residential buildings in Kumamoto. Volunteers’ support is essential regarding the extensive damage. However, walking through debris in thin-soled sneakers is awfully dangerous. There were even reports about volunteers getting injured after stepping on a nail in the ruins. 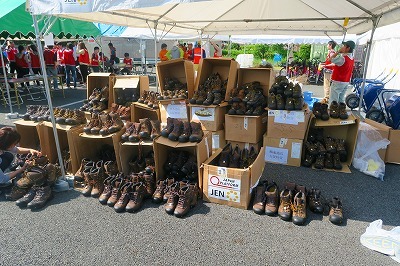 Thanks to supports from Keen (shoe maker), Japan Platform (aid organization) and others, JEN is finally able to lend protective shoes to those dedicated volunteers who help victims with rubble removal. 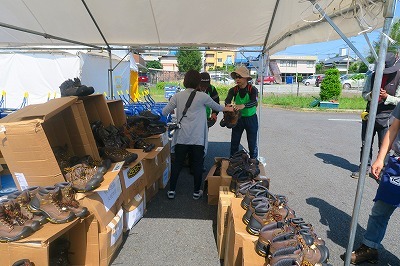 Protective shoes get distributed to volunteers through Kumamoto City Council of Social Welfare responsible for recruiting, assigning work to, and dispatching volunteers. 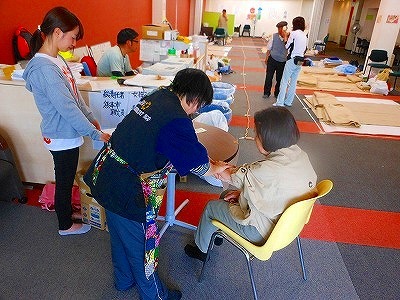 This picture was taken at the volunteer center of Higashi Ward. 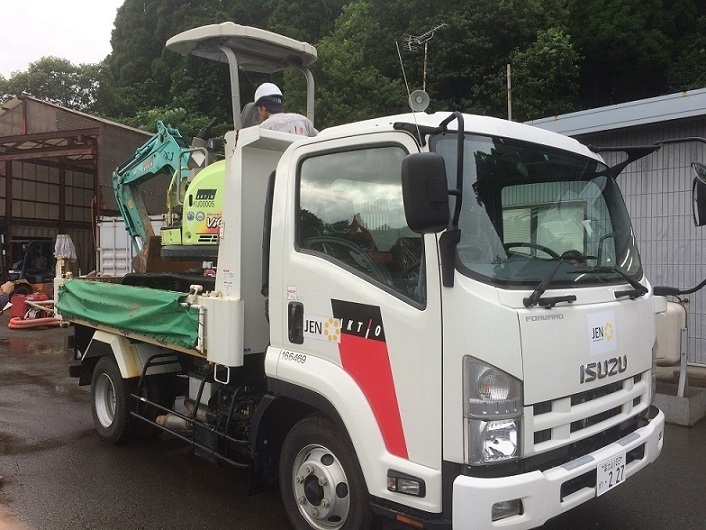 With assistance from OPEN Japan, a disaster-relief organization, we also lent protective shoes to volunteers working with heavy machinery in the hardest-hit Mashiki Town. 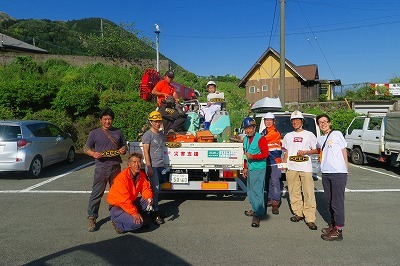 We plan to provide the same service to volunteers in Minamiaso Village as well. 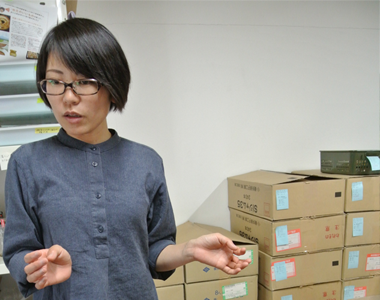 ↑We visited Mashiki Town to distribute protective shoes (JEN’s staff is pictured left). 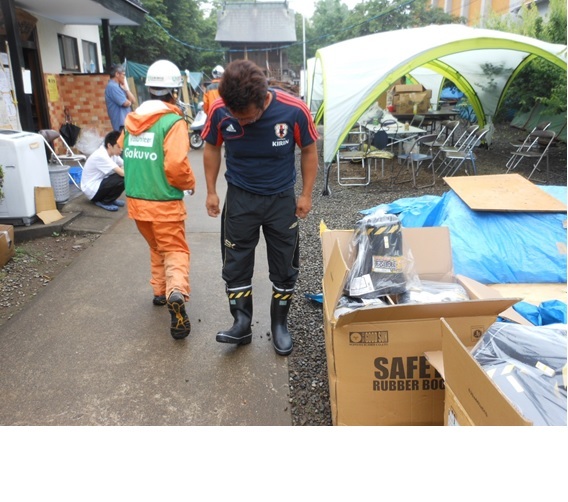 ↑We provide the protective shoes to volunteers according to their shoe sizes. The role of volunteers will become increasingly important in the recovery process. If you want to take part in the volunteer work, please check out the website of Kumamoto City Council of Social Welfare(Japanese). Groups of more than ten people can register in advance through simple steps (individual participants are surely welcomed). There are still people in shelters in Higashi Ward unable to take a bath due to various reasons. Therefore, JEN prepared a vehicle equipped with shower facilities and started providing soothing shower services to such evacuees. 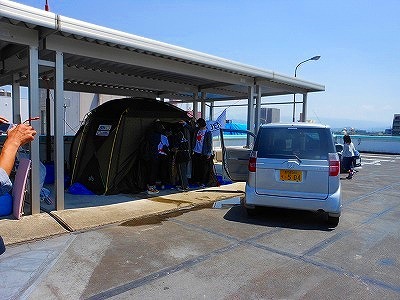 On that day, we set up a portable shower room on the rooftop of an evacuation center, which used to be the office building of Egao, a healthy food company. First, bath users went through medical examination interview conducted by nurses. After measuring blood pressure and body temperature, nurses asked for their individual physical conditions to make sure that their bodies are functioning normally and check if special assistance is needed. 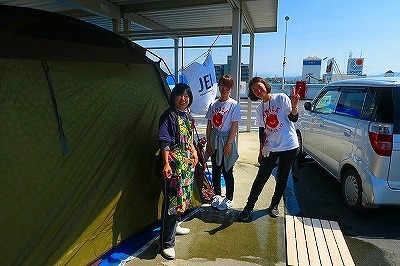 ↑We got two volunteers from Egao to help us. A nursing stuff is giving lectures to them. After the medical examination, we provided every bath user with a set of shampoo, conditioner, body soap, and towel. ↑We received donations of shampoos, conditioners and so on from ALBION, a cosmetics producer. Time to go to the shower room! JEN’s staff member drives those who have difficulties walking up to the rooftop. While people are in the shower, we were standing by outside in case they need any assistance. Some evacuees told us they had lacked the chances to take a bath for a long time after the earthquake, except washing hair once at a hair salon. The late-coming first shower made them gleeful. We delivered ALBION’s donation products like shampoos to those living in the shelter as well as others in need. They were very pleased by the prompt supplement. 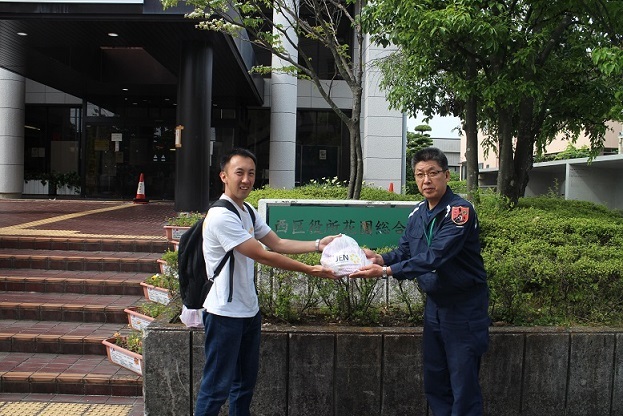 We delivered relief goods donated by ifRentacar Auto-service Corporation to kindergartens, nursing home, and Higashi Ward Office. 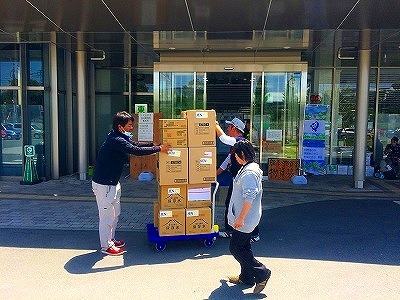 Yamanami day-care center for children, where we offloaded diapers and others products, has become one of the depots for relief goods transporting from outside. We were informed that through families with their children attending the kindergarten, the diapers would be provided to those in needs living in the worst-hit areas like Mashiki Town. 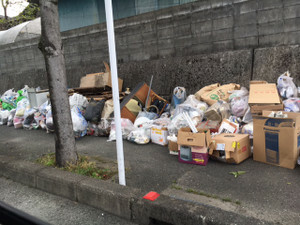 Mr. Yamazaki, the principal of the kindergarten, told us that she reopened the kindergarten on April 25, but only about 80 percent of the former 250 children returned. Many other kidsmoved out of the town with their families that now depend on their relatives. Even among those who returned, quite a few started crying as soon as their mothers left, which made she feel that her children were under a lot of stress caused by the earthquake. Therefore, we think that psychological support to victims will be necessary. After that, we drove to Higashi Ward Office and delivered supplies in urgent needs, such as water, with the help of volunteers. This office also functions as a depot for relief goods, so we saw several residents there coming to pick up things they need. The picture shows piles of waste that used to be the victims’ household items. According to the team (as of 17th April), the victims’ needs on the ground were NFIs (Non-Food Items); and water, blankets, nappies for babies and elderlies such as necessities for everyday life. Due to continuous aftershocks, the damages in the affected areas are changing rapidly, and so as needs on the ground. JEN has co-operated with the local authorities and we have organising the support activities. Following the updates from the team will be posted soon here in the report. Initial emergency support Team is sent to Kumamoto, Japan in 15th April, 2016. Their first mission was the research of quake damages in Kumamoto. he damages were seemed like very intensive, however, there was the main shock in the midnight of 16th April. Due to the main shock, the situation completely changed; at the same time, entire member of the team in Kumamoto was safe. Now, the team is working out what we can do and what the local people’s needs are. Following the details from the team will be updated soon here in the report.